Marissa Panko looks to make a dash for home plate. The junior centerfielder was among three NU players who received All-Big Ten honors this week. Wednesday was a special day for three of Northwestern’s student athletes, just in advance of the team’s Thursday matchup against Purdue in the first round of the Big Ten Tournament. For the 16th straight season, at least three members of the Wildcats (24-28, 10-13 Big Ten) received All-Big Ten honors. Junior centerfielder Sabrina Rabin and junior shortstop Marissa Panko were named to the All-Big Ten second team, while senior first baseman Alcy Bush was named to the All-Big Ten defensive team. Rabin adds the distinction to her long list of accolades, which includes the Big Ten 2015 Rookie of the Year, first-team honors that same season and second-team honors in the 2016 season. NU’s leadoff hitter and its biggest offensive sparkplug, Rabin credited her teammates for helping her to score so many runs — she leads the Cats far and away with 45 this season. 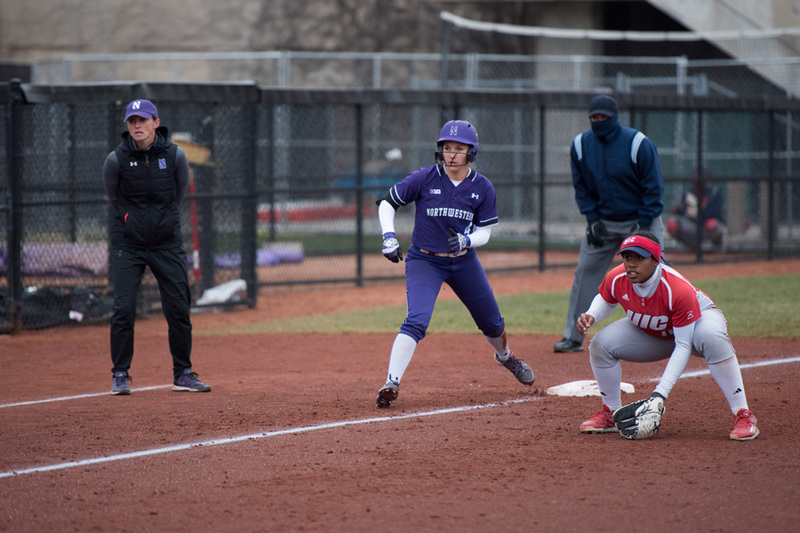 Rabin led the Big Ten in stolen bases, with 12 in conference play, while Panko finished sixth and also led NU with a .379 average against conference opponents. On the other hand, Bush has batted near the bottom of the lineup throughout the season, but still managed to mash three home runs. She said the honor came to her as a bit of a surprise. After falling short of a .500 record and failing to qualify for the NCAA Tournament, the Cats’ final challenge this year is the conference tournament, which will be played over a three-day period in Ann Arbor, Michigan. NU, the eighth seed, will face off against the ninth-seeded Boilermakers (20-35, 9-14) in the first round. The game will be a rematch of a one-sided series played by the two teams weeks ago, in which NU won all three games and outscored the Boilermakers 24-7. But Rabin said history is a poor indicator of postseason outcomes. In recent weeks, coach Kate Drohan has spoken repeatedly of sharp defense as the key to her team’s success. She said the same applies to the month of May and the tournament, especially after the Cats committed five errors in its one loss to Iowa last weekend. Drohan has yet to announce the game’s starting pitcher, but a likely candidate is sophomore Kaley Winegarner, who has had a breakout season in her second year. Over the weekend against Iowa, Winegarner threw two complete games, improved her record to 8-6 and lowered her ERA to 2.98. Bush said she has seen Winegarner develop into a “warrior” this season. Winegarner and the Cats will be featured on the Big Ten Network on Thursday morning at 10 a.m. as they fight to advance to the tournament’s second round.